Football in Mqabba is believed to have started in 1915-16 (there are no official records to back this data). Old timers from the village used to say that some soldiers stationed at Mqabba during the First World War played football on a stretch of land known as 'Fuq il-Mentna'. Among the soldiers were a few local lads who, although never identified, have come to be regarded as the pioneers of football in the village. After the war, the soldiers left the area and football in the village was suddenly interrupted. It had to be the end of another world war to herald the revival of the game in Mqabba. Some time around 1944 another team was formed. It was, however, a modest team with very little ambitions except, perhaps, to play friendly matches against service teams and other amateur sides from neighbouring villages. Unfortunately, we do not even know the name of this team. All we know is that they used to hold their kickabouts in a deserted area which was later taken over by the RAF to build one of their runways. Many of the original players who formed part of the first team from Mqabba emigrated to Australia. Therefore, when Mqabba Ramblers were founded some time around 1950, they found it very difficult to recruit local talent but by the mid-1950's, they were well established in local amateur circles. In 1955-56, they joined MAFA and with players of the calibre of full-back Suda, A. Fitzgerald, later of Sliema Wanderers, Billy Dally and Eddie Bonnet of Floriana, Joe Aquilina of Sliema, Armeni of Hamrun Spartans, Wistin Mallia and Sultana of Melita and P. Muscat of Hibernians, they were bracketed among the best amateur teams on the island. In those days, the MFA had a serious dispute with MAFA and as a result, the parent association began to organise its own amateur competitions. A number of new teams sprouted all over the island and chose to take part in these competitions. Among them were two teams from Mqabba, the Rovers and the Hajduks. A number of far-sighted people, led by Richard Spiteri, then proposed a merger between the two clubs. This proposal was accepted and the two clubs amalgamated under the name of Mqabba Hajduks. The Hajduks played their maiden match on October 12, 1958 against Atalanta SC in the Amateur League. After linking up with Mqabba Rovers, the Hajduks joined the MFA and played their first league game against San Gwann on October 14, 1962 in the Third Division. Since then the club have made huge steps forward. Like all other clubs, Mqabba have had their ups and downs. The good seems to outweigh the bad though, especially when one remembers the golden period between 1982 and 1995 when Hajduks rose from the Third Division to the Premier Division. Throughout those years, football in Mqabba was really on a high. 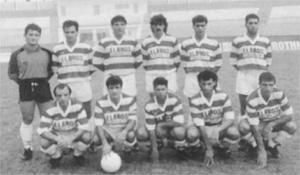 Since then the club's fortunes have waned but with the characteristic enthusiasm of their supporters, that glorious period in the club's history may soon return as Mqabba are currently challenging for promotion to the Premier League.